α-Emitting radionuclides have radiobiological properties that make them particularly attractive for the therapy of a number of difficult-to-treat diseases—such as cancers that are blood-borne or disseminated throughout the body—as well as residual cancer remaining after surgery. While there are many α-emitting radionuclides in nature, only ten have been identified as potentially useful for medical applications. And unfortunately, most of the members of this useful subset are difficult to obtain or are very expensive to produce. Despite these limitations, however, the enticing prospect of using these radionuclides to address medically unmet needs has prompted efforts to attach them to disease-targeting vectors and test their therapeutic efficacy in animal models of disease. Both metallic and non-metallic α-emitting radionuclides have been explored for targeted therapy, and as such, a variety of approaches to incorporating these radionuclides into targeting vectors have been developed, including direct covalent modification and the use of bifunctional chelators. While a fair number of bifunctional chelators have been developed, only a handful—e.g. CHX-A″-DTPA, DOTA, and HOPO—can be used for both α-emitters and radionuclides with imaging properties. In contrast, one of the α-emitting radionuclides that is not readily chelated, 211At, can be attached to disease-targeting agents through efficient electrophilic aromatic substitution reactions using trialkylstannyl intermediates or direct labeling on aromatic boron cage moieties. 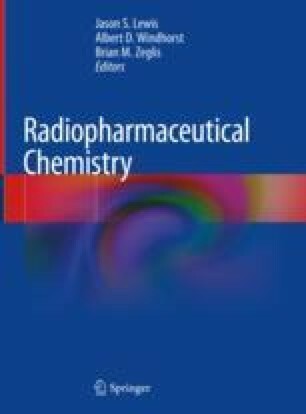 Radiopharmaceuticals containing α-emitting radionuclides are undergoing preclinical investigations for treatment of a number of cancers as well as the treatment of drug-resistant bacterial and viral infections. Furthermore, an α-emitting radiopharmaceutical—223RaCl2 (Xofigo™; Bayer HealthCare Pharmaceuticals, Inc., Whippany NJ, USA)—is an FDA-approved product, and several other radiopharmaceuticals containing α-emitting radionuclides have progressed to clinical trials.